There aren’t a great number of Old West games on PC. There’s Gun and Desperados – both good – and, newer, Call of Juarez: Gunslinger, but it’s a setting with a dearth of games. But even if it was busier, I reckon Westerado would still stand out. A revenge tale, a hunt for a family’s killer – it’s an old story, but the game’s no cliche. I reviewed it in another time and place, when it was a flash game. Now it’s poised to hit Steam later this year as Westerado: Double Barreled, expanded and polished. It still sounds a lot like the flash game, but that’s no bad thing. The investigation into the murder of your family is the driving force, but to find out who the killer is, you need to work your way through the Old West. A banker might have information, but he’ll only give it to you if you do some unsavoury jobs for him. A bartender got a look at him; he’ll give you the skinny if you kill some bandits. Each favour yields slight information. He has a black hat. He wears a belt. Slowly, a picture forms, and eventually you can hunt down the killer. Or you can just point your gun at anyone and wait for them to spill their guts. Or do it for them. There’s a hint of roguelike in there. When your lives are drained, then you’re dead. The killer changes. The investigation starts again. The whole thing can be completed in 15 minutes, but exploring the Old West and listening to the old stories can take hours. 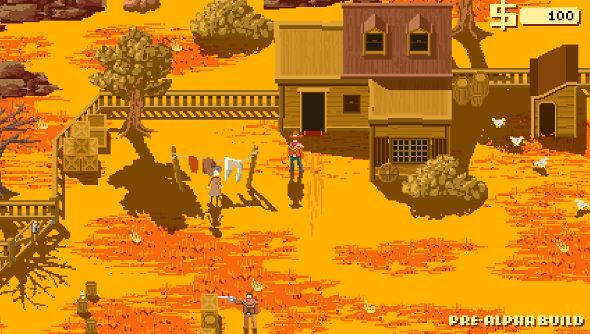 Double Barreled offers more weapons, “a bigger, better, badder and funnier version of the original Westerado”, full controller support and 720/1080p resolutions. Keep your eyes peeled for it late this year. You can play the original now, over at Adult Swim.